It is a form of x-ray imaging, where digital X-ray sensors are used instead of traditional photographic film. An advantage of using digital x-rays verse the traditional x-rays, is the amount of time it takes to transfer, enhance, and view the images while admitting less radiation. 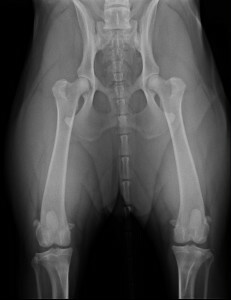 Digital Radiography is an excellent diagnostic tool. It allows us to view inside the body to detect medial conditions, abnormal fluids, broken bones, and foreign body obstructions. In addition, Digital Radiography allows our doctors to quickly share these films with vet specialists all over the country.